If looks are important to you in a household appliance then the Dimplex dehumidifier 16L – Forté won’t disappoint. It has a black and white colour finish. The extraction vent is at the top of the device and air filter at the back. It’s a smooth looking device with just one rotary dial on the top. Dimplex is known for its easy use dehumidifiers and the DXDH16N follows form. The Dimplex 16L – Forté is a compressor, a variant to its predecessor the DXDH10 refrigerant device. This means the 16L is better placed inside spaces that could benefit from a little extra heat. Why? well, the 16L draws the air from the room which passes through the filter and over cold coils. As the coils cool the air, the moisture drips into the water tank at the bottom of the device. The dry air is reheated to room temperature and then blown out into the room. The 16L is beneficial for use inside the home rather than outdoor spaces. This is also a good aspect to consider if you are trying to reduce energy bills. At only 410 watts of power per hour its energy consumption is lower than most of its competitors. The 16L runs more efficiently in warmer temperatures between 5 and 35℃. Optimum performance will peak around 20℃. The device has a auto-defrost function which stops it from freezing up in cold temperatures. If you have a cooler space, you may benefit from a dehumidifier that works efficiently at lower temperatures. The EcoAir DC12 Compact retails at a similar price and outperforms the 16L at temperatures as low as 2℃. 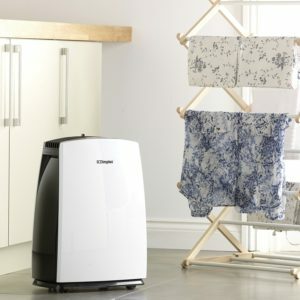 The Dimplex dehumidifier 16L – Forté claims to extract 16 litres of water a day from the air. This is ideal for reducing excess damp and moisture. Thus enabling you to control condensation and mould growth if these are conditions you wish to banish from your home. During initial use the device will regulate its cycle. After which, the device will rarely use its 16 litre extraction capacity. It is, however, good to know that it is there if you need it. In a normal domestic environment the Dimplex 16L will extract between 3 and 5 litres a day. The 16L is better for larger homes and spaces. If you require a dehumidifier for a smaller living space then the Dimplex DXDH10 would be a better option. Like most compressor dehumidifiers the Dimplex DXDH16N does a great job at drying laundry. The water tank has a indicator that lights up when the tank needs emptying. It has an auto-shut off function which means the device will stop extraction when the tank is full. Emptying the tank simply requires pulling it out from the back of the device. There is no handle or lid to prevent spillages. However, there is a good height on the tank which extends past the maximum water level. Like most dehumidifiers, the 16L has a continuous drain option. Please note that the drainage pipe is sold separately and can be bought from Dimplex. To use the continuos drain just remove the tank and insert the pipe into the outlet. This will indicate to the machine to operate in continuos drain mode. Although the Dimplex 16L is great for people with a conservative budget, it is lacking somewhat. Most reviewers found the device to be heavy at 13.3 kg. It does make up for this with nicely hidden and easy glide cator wheels. If you want to use the device in multiple rooms then the castors will come in handy. If you need to carry the device, it has scoop handles hidden away in the sides. This design feature adds to its overall compact look. At the back of the device you will find the air filter. It will trap dust while the machine is extracting the air. The filter does not have an anti-allergen coating. Therefore, I would not recommend this dehumidifier for those who have allergens. There are other dehumidifiers that have an anti-allergen coating on the air filter. However, dehumidifiers with an anti-allergen feature will have a higher price point. To remove and clean the filter, you must first remove the water tank. The filter slides down and out from the back of the device. A damp cloth or a vacuum nozzle attachment will effectively clean away dust. The Dimplex dehumidifier 16L Forté has a simple rotary dial and 3 indicator lights. In the most counter-clockwise position the device is in the ‘Off’ mode. In the most clockwise position the device will operate in continuous mode. There are nine relative humidity (RH) levels that can manually change the humidistat within 10% boundaries. Level 5 is omitted because the machine inclines from 40 – 60% between level 4 and 6. With the omission of level 5, it means that the humidistat cannot be set to 50% RH. For most homes, this is the ideal level of RH so it is a shame that the device cannot be set to this level. The first light on the control panel shows when the device is in operation. The second lights up when the tank is full and needs emptying. The third and final light flashes on when the device enters auto-defrost mode. The humidistat will automatically shut off when it has reached the desired humidity level. You can see how the controls work here. 1x Dimplex 16L – Forté DXDH16N and manual. The forté range is popular amongst customers buying a dehumidifier for domestic purposes. The 16L model has the second biggest extraction capacity in the range. It's also competitively priced making it a good option for customers. In terms of performance, the Dimplex 16L is for domestic use only in spaces of about 24m2. That's a medium sized room or a home with a few bedrooms. It's ideal in home conditions with little, if any, damp or if you dry laundry often. On this basis customers on Amazon seem quite happy with their purchase. In conclusion, this is a nice dehumidifier if you have a medium size home where you wish to regulate the humidity.